Karen Kilimnik, Battles, or the Art of War, 1991, Mixed media installation. Installation view, 303 Gallery, New York, April 4–25, 1991. 303 Gallery was first established by owner and director Lisa Spellman in 1984 at 303 Park Avenue South. Over the past 34 years, 303 Gallery has occupied five locations (including the Norman Foster + Partners-designed building in Chelsea that the gallery moved into in 2016) and has mounted literally hundreds of exhibitions of boundary-pushing artists, many of whom are now central to the contemporary art-historical canon—and many of whom still show with 303 Gallery. Here, Spellman walks us through six crucial shows in 303 Gallery’s storied history. 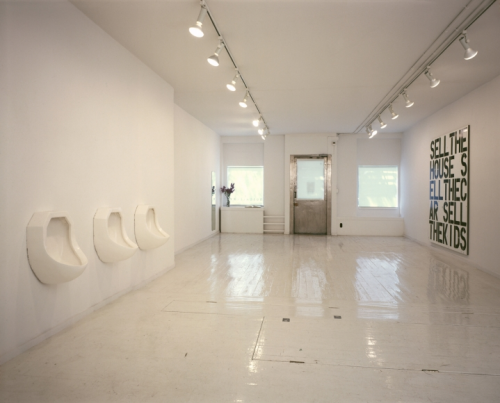 Installation view, Robert Gober and Christopher Wool, 303 Gallery, New York, April 15 - May 8, 1988. The show was a collaboration between Wool and Gober, back when the gallery was in the East Village, on 6th Street. In this view you can see two now-iconic works, Christopher Wool’s "Apocalypse Now" painting opposite Bob Gober’s sculpture, "Three Urinals"; it was the first time either work was exhibited. There was a booklet published for the show too, with writing by Gary Indiana. 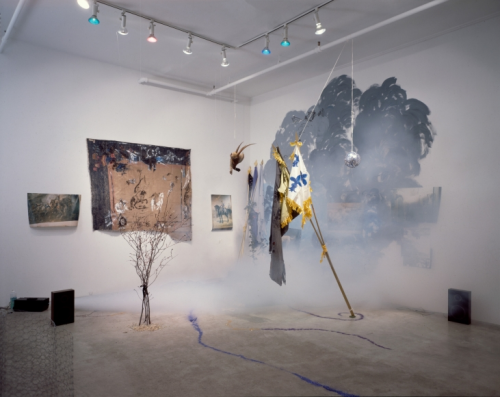 Karen Kilimnik, "Battles, or the Art of War", 1991, Mixed media installation. 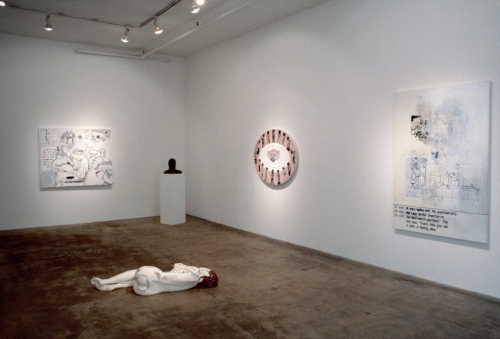 Installation view, 303 Gallery, New York, April 4–25, 1991. Karen Kilimnik’s first solo show at the gallery was in 1991. She showed several installations in the space, separate works but with one leading into the next. They covered a variety of themes, ranging from suicide and drugs to schoolyard massacres to Napoleonic clashes—as in "Battles, or the Art of War", 1991, which you can see here. When people came off the elevator, they stopped in their tracks—there was this dense fog everywhere. 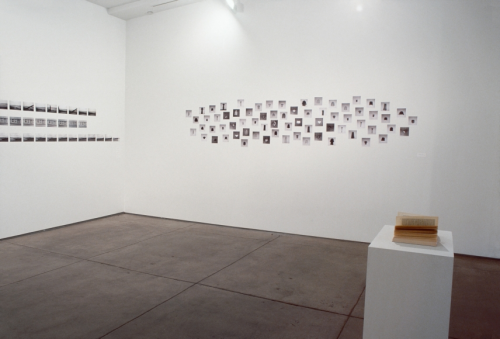 Installation view, Sue Williams, 303 Gallery, New York, May 2-30, 1992. Sue's first solo show at the gallery paintings and sculptures addressing female representation and domestic violence. CNN covered it, and then hundreds of women were coming in, from shelters, from all over the country, because they had heard about it on T.V. These works were very personal in nature, but tapped into a collective experience, an outrage. 35mm film transferred to laserdisc, 9 minute continuous loop. Exhibited at 303 Gallery, New York, November 1–December 20, 1997. This was a real breakout piece for Rodney. The work was exhibited at the Venice Biennale in the Canadian Pavilion, and at 303 Gallery in the same year. It’s a looping film where Graham, in character as a shipwrecked 18th-century sailor, is trapped in a cycle of getting knocked out by a fallen coconut, only to reawaken and begin shaking the tree all over again. The saturated palette, slapstick humor and pop-culture references that people associate with his work now are all present in this film. It continues to be a favorite piece for his diehard fans. Hans-Peter Feldmann, Installation view: 303 Gallery, New York, July 13 - August 11, 2000. Our third show with Hans-Peter in 2000 included works that evoked a sense of place. The first piece you encountered was an installation called "Bed With Photograph". It was an unmade bed, a book on the floor and a nightstand with a framed photo among other personal objects, as if someone had just left. He also showed several photo series, including all the clothes of a woman, a suite of 70 photos with each image documenting a single item of clothing. Formal and calculated in its approach, the work builds into a portrait that is quite intimate, and yet, anonymous. We will be showing this work at Independent New York. 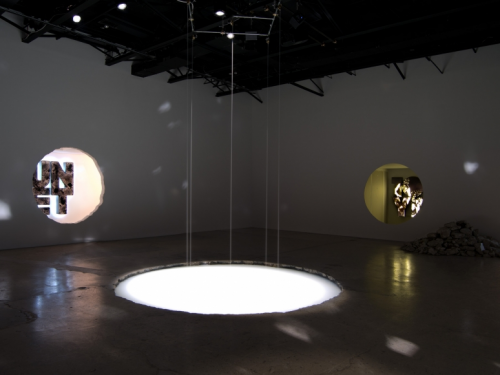 Doug Aitken, 100 YRS, Installation view, 303 Gallery, February 1 - March 30, 2013. Doug Aitken’s most recent show was in 2013 and closed out our 547 West 21st Street location. The show centered on "Sonic Fountain" where water dripped from 5 rods suspended from the ceiling, falling into a giant crater dug out of the gallery floor. Underwater microphones amplified the sound of the droplets, building into a hypnotic song. The rubble you see in the corner is the concrete removed from our floor. The show had a part 2, where performers staged a demolition of the space over the course of a week, using saws and drills like percussive instruments to cut apart the walls and pile up debris, altering the architecture even further. Doug's eighth solo show opens April 13th this spring, centering on a new video installation.